It is that time again where you get to know a pug from the social media scene in our popular Social Pug Profile series. This week it is the dynamic duo of Norton & Mouse. Get to know Norton & Mouse in their interview. Norton: My friends call me Norty. Mouse: My real name is Macey but I will only answer to Mouse. Norton & Mouse: We are approaching 4 years old. Norton & Mouse: We are only one day apart! We live in Sydney. Not in the busy part but in the lovely leafy suburb of Five Dock. We have a park 3 blocks to the south, a park 2 blocks to the west and a little bay with its own beach 4 blocks to the east. Fun every which way we turn. Norton & Mouse: We are both afflicted with O.C.D. (Obsessive Consumption Disorder) – a very common pug ailment. It causes us to devour any & all types of food – hot, cold, raw, cooked, sweet or savoury. But what makes each of us squeal and run in circles of anticipated delight? Mouse: What else would a Mouse love….cheese. Norton & Mouse: We are very fortunate to have a basket full of fun toys. We like to randomly select and play with a toy for approximately 2 mins at a time. Being the creative type, we also play with water bottles, toilet rolls and mummy’s shoes whenever we get the chance. Norton: But I love my mini-tennis ball that I have had since when I was a little puglet. It’s the pawfect size for me. Mouse: And I love my squeaky-skunk. It’s so soft and furry I can use it as a pillow when I’m done making it squeak. Norton & Mouse: We hate hearing that dirty four letter word…DIET. Once, when our harnesses became a little too snug, we had to go on a strict diet. We told mummy they had shrunk in the wash. However, the tape measure confirmed the cause was not a shrinking harness but bulging waistlines. Our hearty breakfast was reduced to a low-cal mini-meal and our jerky treats replaced with carrots. It was a terrible time. Norton: But I hate getting my face wrinkles cleaned..if I see that baby-wipe coming I’m out of there. Mouse: And for me, pedicures. I like my nails long and having them snipped is a dreadful ordeal. Makes me shudder just to think about it. Norton & Mouse: Apart from cuddles and treats? Adventures! 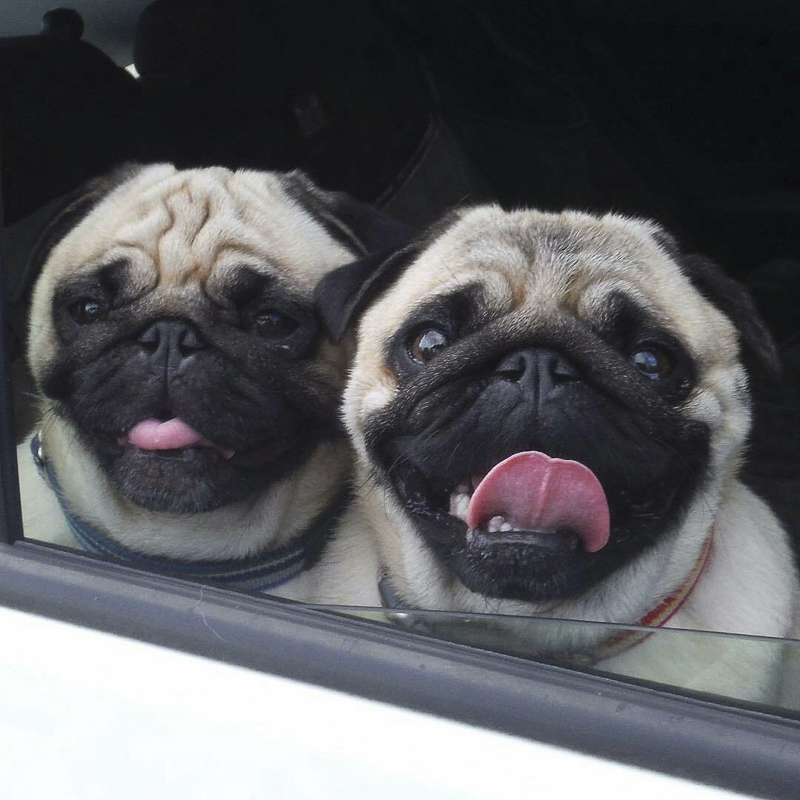 We love going on road trips, especially to the North Coast to visit our nanna. We go there about 4 times a year and get to stay in a beach bungalow for a whole week. We play dune-puggies on the sand, frolic in the surf and go bush walking every day. We have made many furrends on our holidays including Dora the miniature pig and Bill & Ben the goats, just to name a few. Norton: I love swimming. Since we live near the water I go skinny dipping in the canal and bay every chance I get. 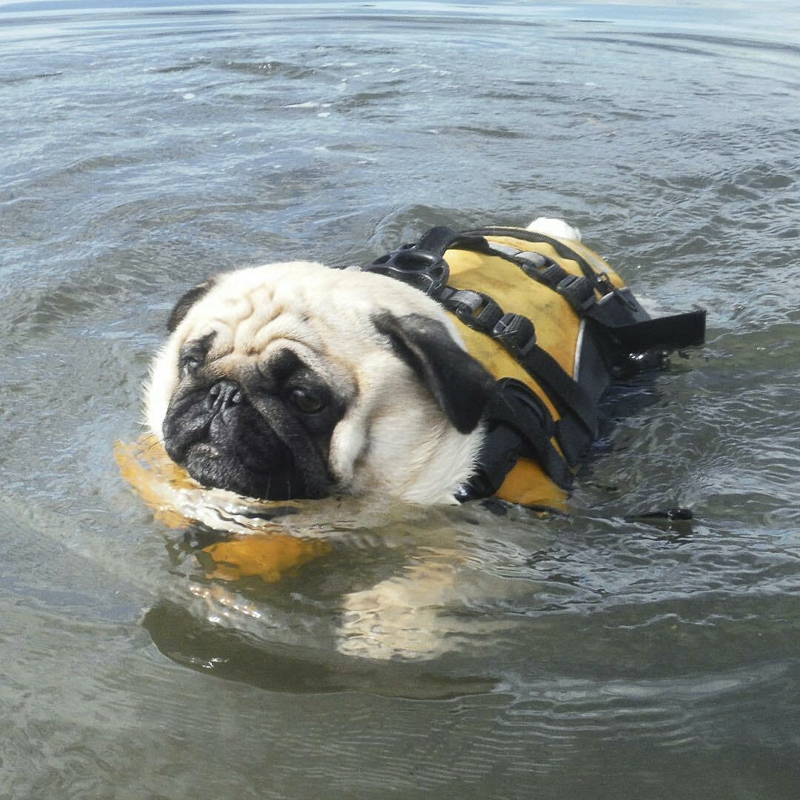 Knowing it’s important to ‘swim safe’, I wear a life jacket so I can paddle out where my paws don’t touch the bottom. 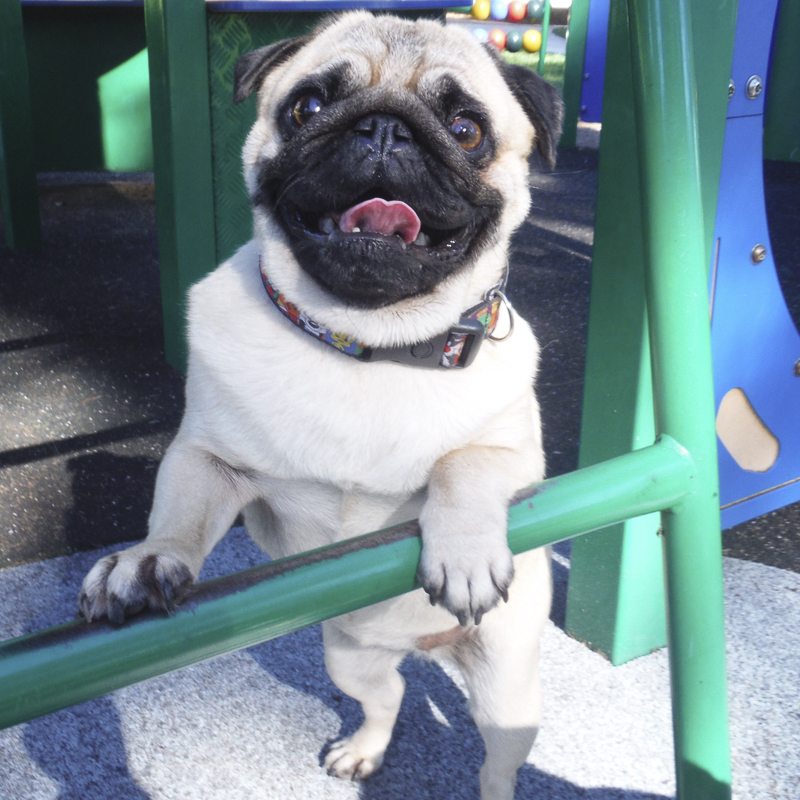 Mouse: I love Sunday’s…we go to Cafe Bones (dog park & cafe) to meet up with our puggy furrends. Just like Norton swimming, my feet hardly touch the ground. I go from lap to lap surfing tables. I get oodles of cuddles and the treats are aplenty. 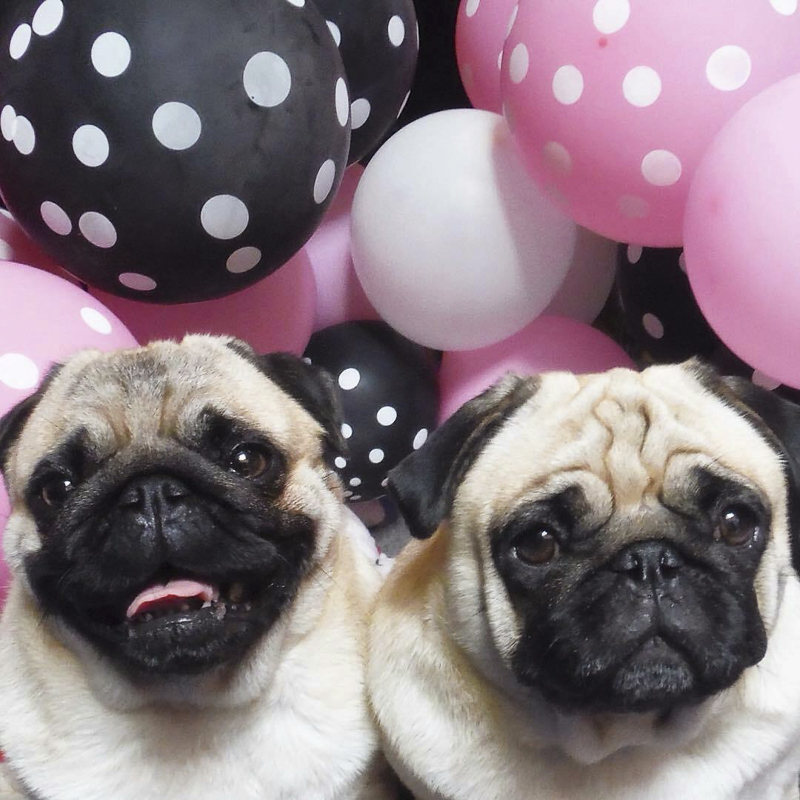 What more can a pug-girl want?! Norton & Mouse: We don’t think so..we left this question blank but mummy added to it when we weren’t looking. Mummy: Norton has a knack of putting his paws on people wearing light, clean pants. He thinks his paw prints make a groovy pattern but not all people think like Norton. His other bad habit is jumping into other people’s cars and playing rabbit, bouncing around from the front seat to the back seat instead of hopping out. Mouse barks at animals on the TV, particularly horses and cows. Her bark is not ferocious but it sometimes scares Parker, our cat, who scoots out of the room with pugs in hot pursuit. However, without a doubt, Mouse’s worst habit is her preoccupation with the smell-roll. Smelly objects, that most would consider repugnant, Mouse considers her-pug-scent. She seeks them out and rubs and rolls until the aroma has been satisfactorily “trans-furred”. Norton: Where do I begin! Apart from being ridiculously handsome and athletic, I am loveable. I make people smile with my goofy antics and if that doesn’t work I lick their ears. Mouse: My eyes. They sparkle when I’m happy, and twinkle when I laugh. I speak with my eyes. They can brighten your day, soften your heart and sweeten your soul. Norton & Mouse: We do like routine but not too routine. We wake mummy early in the morning to have our breakfast…chicken, tuna or sardines seasoned with coconut oil. After brekky we wash our faces, get dressed, and head off on our walk. We like to go somewhere different each day…sometimes to the park, sometimes to the beach and sometimes we drive to a new location to explore and meet new furrends. When we get home it’s time for a little nap. The afternoon is when we do some house-work. Any clothes or shoes left on the floor we will pick up and put away somewhere so no one can find them. We like to go outside and bring in twigs and branches to give our home that natural feel. By late afternoon it’s time for another nap. Early evening we get dressed again and go for a stroll around the neighbourhood. Once back its time to have a game of hide-and-seek with Parker, our 3 legged cat. He hides, we seek. If we can find him (he is a very good hider) we play chases. We chase him then he chases us. He may only have 3 legs but he is very fast. We love playing cat n’ mouse with Parker. Afterwards we have a light super, grab a denta-bone, hop on the lounge and turn on the TV to catch our favourite shows like ‘Bad Dogs’ and ‘Harry’s Practice’. Sometimes we put on a movie. 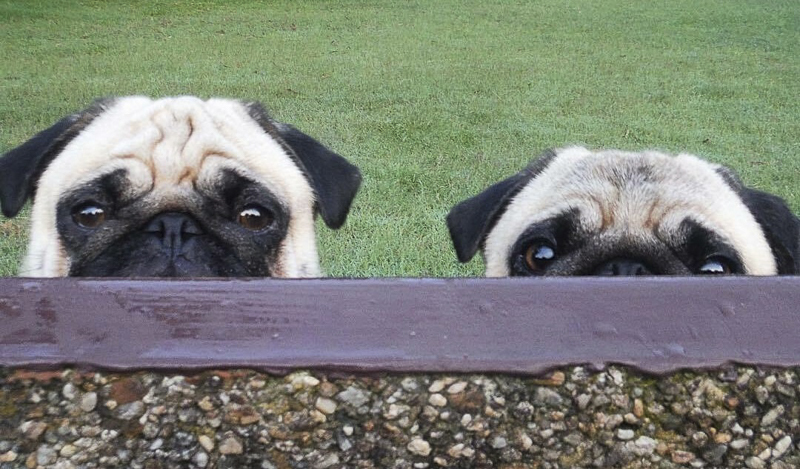 We love watching Frank from Men in Black..he is our favourite pug agent. Mummy watches the TV with us and gives us pug hugs. We usually fall asleep on the lounge and sometimes get carried to bed. We let mummy sleep with us and although we have a pillow each, we are happiest with our heads resting on one.We snuggle & cuddle, snore & snuffle, until the break of dawn. What is your favourite thing about having a sibling? 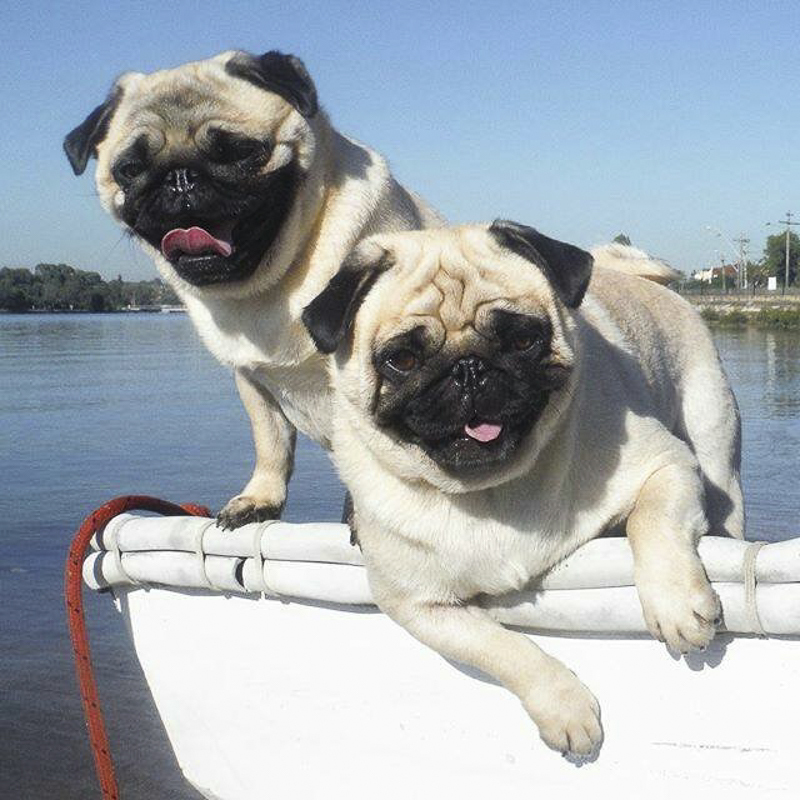 Although we are cousins (our pug mothers are sisters), we are as close as a brother & sister. We’re always together and often get called twins. We are best friends..we play, walk, swim, talk, eat, snort & sleep together. We laugh at each other’s antics, we stand by each other if one of us is scared, we comfort each other if one of us is sad or sick and best of all we are never lonely ’cause we have each other. We get along so well because we have so much in common, but we have differences too. We compliment each other. We combine to make the pawfect duo. Like Batman & Robin, Bonnie & Clyde, bacon & eggs, we are Norton & Mouse. 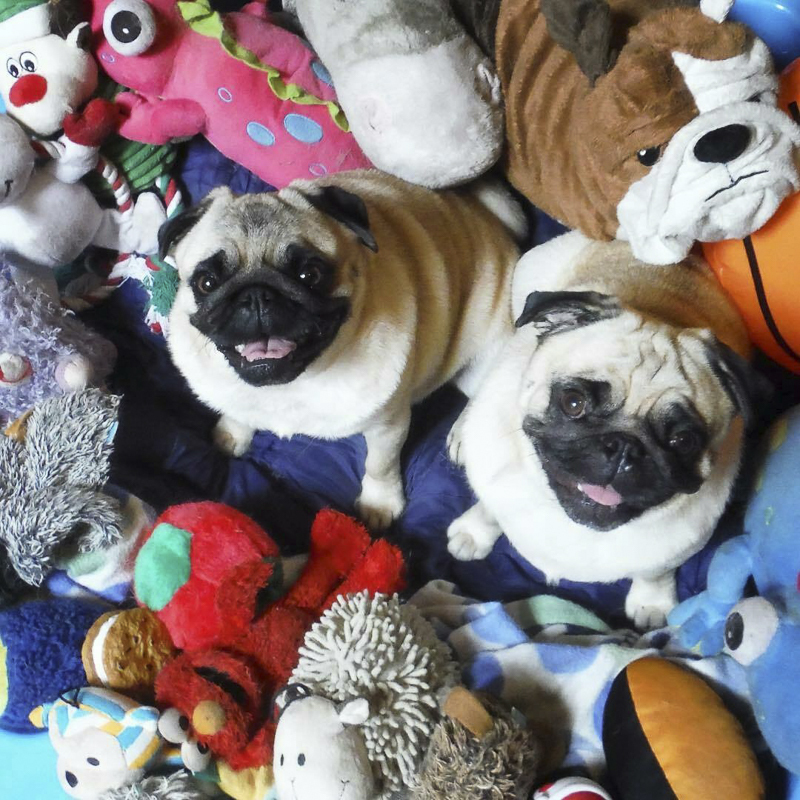 I hope you have enjoyed getting to know Norton & Mouse in this Social Pug Profile interview and be sure to leave a pug love note for them in the comments below.